African physician and philosopher; born in Egypt before 832; died at Kairwan, Tunis, in 932. These dates are given by most of the Arabic authorities; but Abraham b. Ḥasdai, quoting the biographer Sanaḥ ibn Sa'id al-Ḳurṭubi ("Orient, Lit." iv., col. 230), says that Isaac Israeli died in 942. Grätz ("Gesch." v. 236), while stating that Isaac Israeli lived more than one hundred years, gives the dates 845-940; and Steinschneider ("Hebr. Uebers." pp. 388, 755) places his death in 950. Israeli studied natural history, medicine, mathematics, astronomy, etc. ; so that he was reputed to be one who knew all the seven sciences. He was a contemporary of Saadia Gaon, whose works probably inspired Israeli with a love for the study of the Bible. 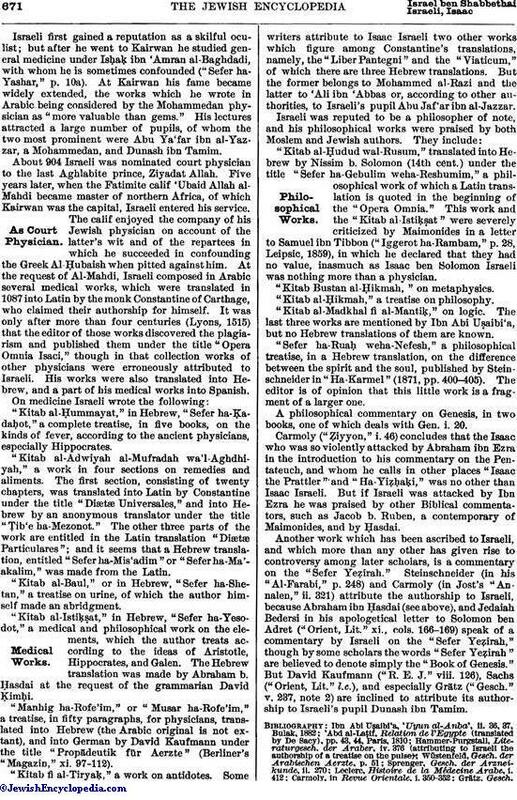 Israeli first gained a reputation as a skilful oculist; but after he went to Kairwan he studied general medicine under Isḥaḳ ibn 'Amran al-Baghdadi, with whom he is sometimes confounded ("Sefer ha-Yashar," p. 10a). At Kairwan his fame became widely extended, the works which he wrote in Arabic being considered by the Mohammedan physician as "more valuable than gems." His lectures attracted a large number of pupils, of whom the two most prominent were Abu Ya'far ibn al-Yazzar, a Mohammedan, and Dunash ibn Tamim. About 904 Israeli was nominated court physician to the last Aghlabite prince, Ziyadat Allah. Five years later, when the Fatimite calif 'Ubaid Allah al-Mahdi became master of northern Africa, of which Kairwan was the capital, Israeli entered his service. The calif enjoyed the company of his Jewish physician on account of the latter's wit and of the repartees in which he succeeded in confounding the Greek Al-Ḥubaish when pitted against him. At the request of Al-Mahdi, Israeli composed in Arabic several medical works, which were translated in 1087 into Latin by the monk Constantine of Carthage, who claimed their authorship for himself. It was only after more than four centuries (Lyons, 1515) that the editor of those works discovered the plagiarism and published them under the title "Opera Omnia Isaci," though in that collection works of other physicians were erroneously attributed to Israeli. His works were also translated into Hebrew, and a part of his medical works into Spanish. "Kitab al-Ḥummayat," in Hebrew, "Sefer ha-Ḳadaḥot," a complete treatise, in five books, on the kinds of fever, according to the ancient physicians, especially Hippocrates. "Kitab al-Adwiyah al-Mufradah wa'l-Aghdhiyah," a work in four sections on remedies and aliments. The first section, consisting of twenty chapters, was translated into Latin by Constantine under the title "Diætæ Universales," and into Hebrew by an anonymous translator under the title "Ṭib'e ha-Mezonot." The other three parts of the work are entitled in the Latin translation "Diætæ Particulares"; and it seems that a Hebrew translation, entitled "Sefer ha-Mis'adim" or "Sefer ha-Ma'akalim," was made from the Latin. "Kitab al-Baul," or in Hebrew, "Sefer ha-Shetan," a treatise on urine, of which the author himself made an abridgment. "Kitab al-Istiḳat," in Hebrew, "Sefer ha-Yesodot," a medical and philosophical work on the elements, which the author treats according to the ideas of Aristotle, Hippocrates, and Galen. The Hebrew translation was made by Abraham b. Ḥasdai at the request of the grammarian David Ḳimḥi. "Manhig ha-Rofe'im," or "Musar ha-Rofe'im," a treatise, in fifty paragraphs, for physicians, translated into Hebrew (the Arabic original is not extant), and into German by David Kaufmann under the title "Propädeutik für Aerzte" (Berliner's "Magazin," xi. 97-112). "Kitab fi al-Tiryaḳ," a work on antidotes. Some writers attribute to Isaac Israeli two other works which figure among Constantine's translations, namely, the "Liber Pantegni" and the "Viaticum," of which there are three Hebrew translations. But the former belongs to Mohammed al-Razi and the latter to 'Ali ibn 'Abbas or, according to other authorities, to Israeli's pupil Abu Jaf'ar ibn al-Jazzar. "Kitab al-Ḥudud wal-Rusum," translated into Hebrew by Nissim b. Solomon (14th cent.) under the title "Sefer ha-Gebulim weha-Reshumim," a philosophical work of which a Latin translation is quoted in the beginning of the "Opera Omnia." This work and the "Kitab al-Istiḳat" were severely, criticized by Maimonides in a letter to Samuel ibn Tibbon ("Iggerot ha-Rambam," p. 28, Leipsic, 1859), in which he declared that they had no value, inasmuch as Isaac ben Solomon Israeli was nothing more than a physician. "Kitab Bustan al-Ḥikimah," on metaphysics. "Kitab al-Ḥikmah," a treatise on philosophy. "Kitab al-Madkhal fi al-Mantiḳ," on logic. The last three works are mentioned by Ibn Abi Uṣaibi'a, but no Hebrew translations of them are known. "Sefer ha-Ruaḥ weha-Nefesh," a philosophical treatise, in a Hebrew translation, on the difference between the spirit and the soul, published by Steinschneider in "Ha-Karmel" (1871, pp. 400-405). The editor is of opinion that this little work is a fragment of a larger one. A philosophical commentary on Genesis, in two books, one of which deals with Gen. i. 20. Carmoly ("Ẓiyyon," i. 46) concludes that the Isaac who was so violently attacked by Abraham ibn Ezra in the introduction to his commentary on the Pentateuch, and whom he calls in other places "Isaac the Prattler", and "Ha-Yiẓḥaḳ," was no other than Isaac Israeli. But if Israeli was attacked by Ibn Ezra he was praised by other Biblical commentators, such as Jacob b. Ruben, a contemporary of Maimonides, and by Ḥasdai. Another work which has been ascribed to Israeli, and which more than any other has given rise to controversy among later scholars, is a commentary on the "Sefer Yeẓirah." Steinschneider (in his "Al-Farabi," p. 248) and Carmoly (in Jost's "Annalon," ii. 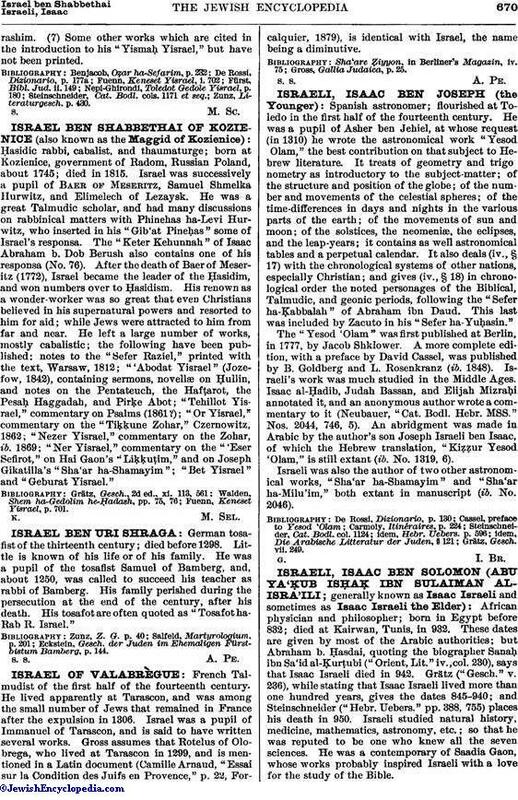 321) attribute the authorship to Israeli, because Abraham ibn Ḥasdai (see above), and Jedaiah Bedersi in his apologetical letter to Solomon ben Adret ("Orient, Lit." xi. cols. 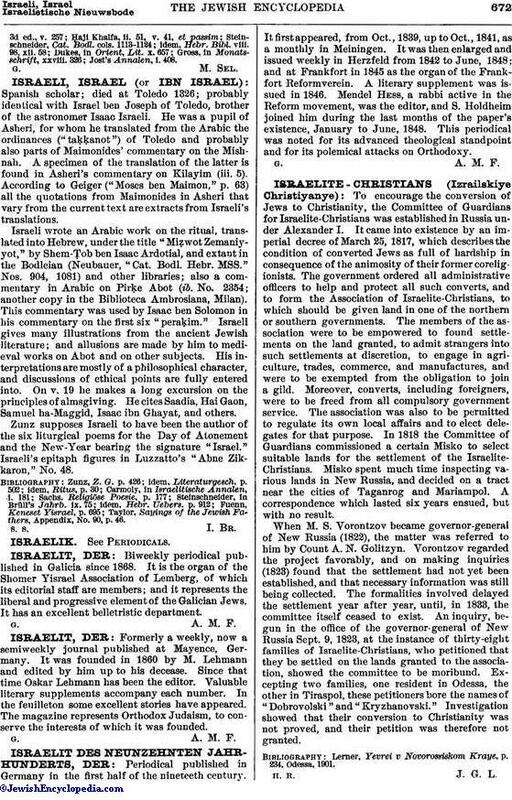 166-169) speak of a commentary by Israeli on the "Sefer Yeẓirah," though by some scholars the words "Sefer Yeẓirah" are believed to denote simply the "Book of Genesis." But David Kaufmann ("R. E. J." viii. 126), Sachs ("Orient, Lit." l.c. ), and especially Grätz ("Gesch." v. 237, note 2) are inclined to attribute its authorship to Israeli's pupil Dunash ibn Tamim.